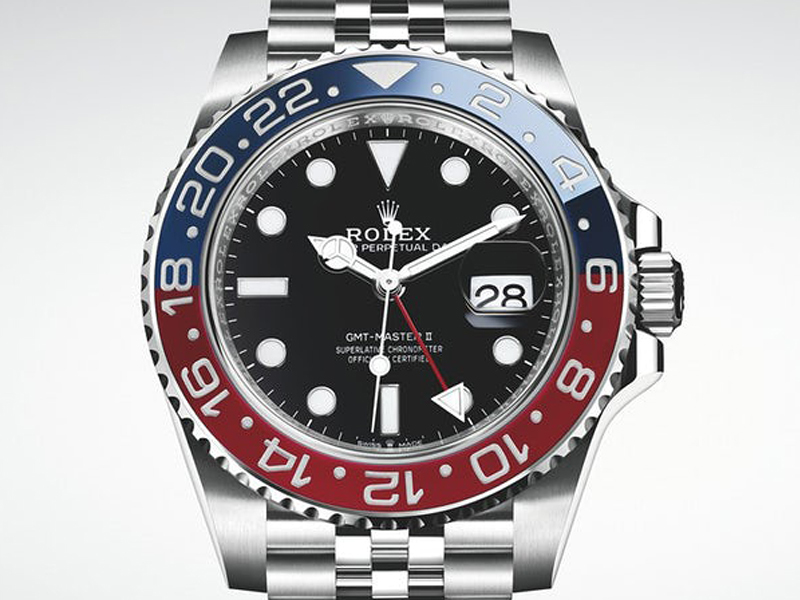 Rolex GMT-Master II Meteorite "Pepsi" Rolex GMT-Master II Meteorite "Pepsi"
In the past we have seen Rolex release several of their trustworthy models, such as the “Datejust”, “Day-Date” or Daytona” with the unique meteorite dial. 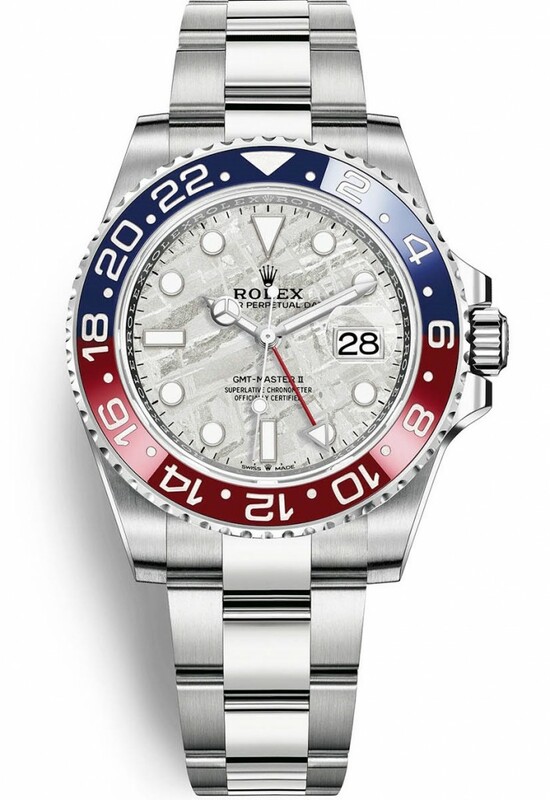 Now Rolex has also updated their iconic “Pepsi” bezel “GMT-II” timepiece with a meteorite dial for Baselworld 2019. 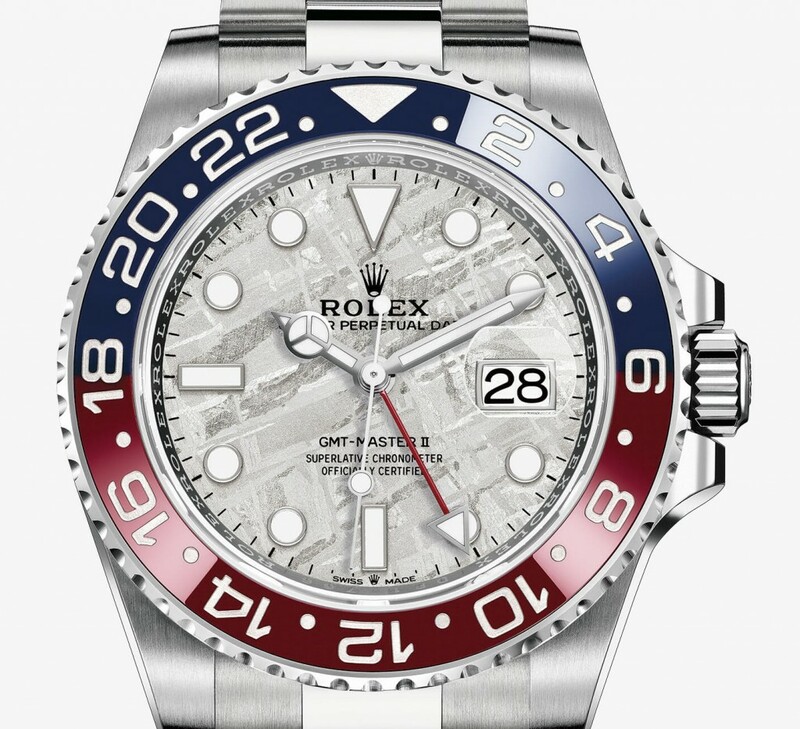 All true Rolex aficionados undoubtedly rejoiced with the return of the “GMT-Master II Pepsi” (Ref#: 126710BLRO) model, at last year’s Baselworld 2018. 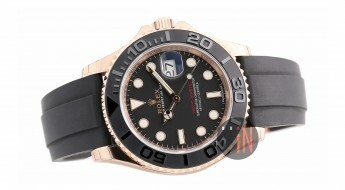 Although it proved almost impossible for many collectors to actually get their hands on one for themselves. 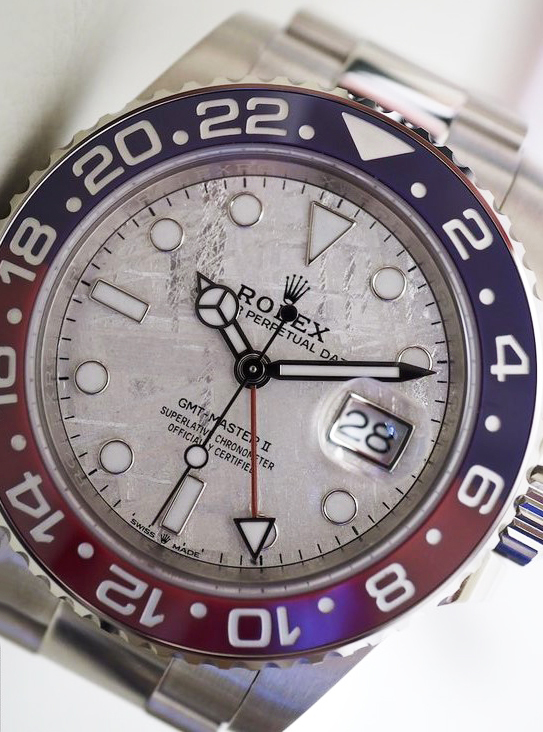 But, it’s a new year and Rolex has laid out another chance for a happy some to purchase this even more unique “Pepsi” bezel with a meteorite dial. 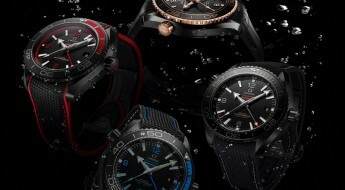 Although many are still better off managing their expectations for this watch is being highly sought after and will quickly sell-out and probably reappear above retail elsewhere. The new GMT-II comes in a 40mm case made of 18k white gold with a mixture of polished and brushed finishing, plus a white gold screw-down case back. Case wise this is the same design and dimensions found on the updated “Batman” (Ref#: 126710BLNR) and last year’s aforementioned GMT-II models with the slightly redesigned lugs and sides; but instead of stainless-steel its crafted out of white gold. 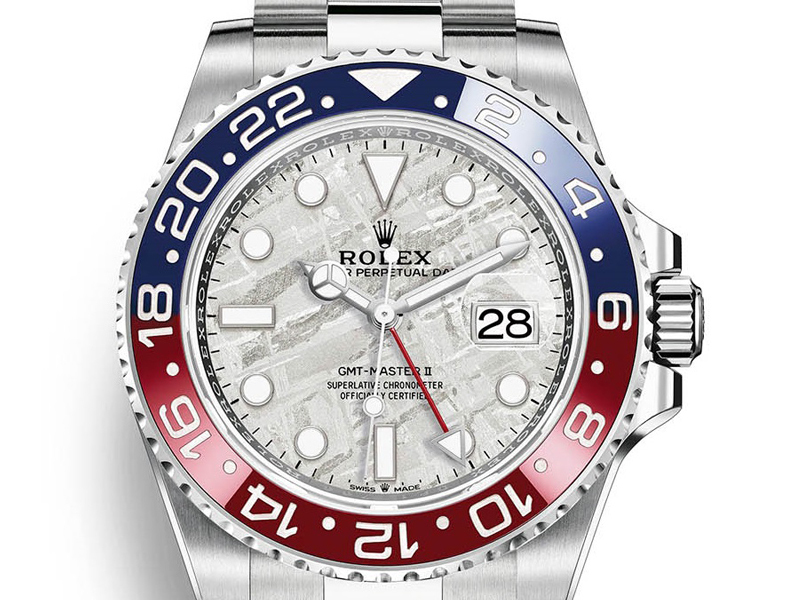 Mounted to the watch is the iconic 24-hour bi-directional rotatable bezel with a graduated two-color Cerachrom insert of red and blue, commonly referred to as the “Pepsi” due to its similar color scheme. 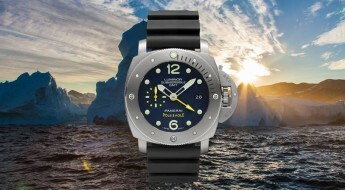 Topped with a scratch-resistant sapphire crystal and featuring a screw-down crown with a “Triplock” triple waterproof system, which assists with water-resistance on this watch reaching up to 100 meters (330 feet). 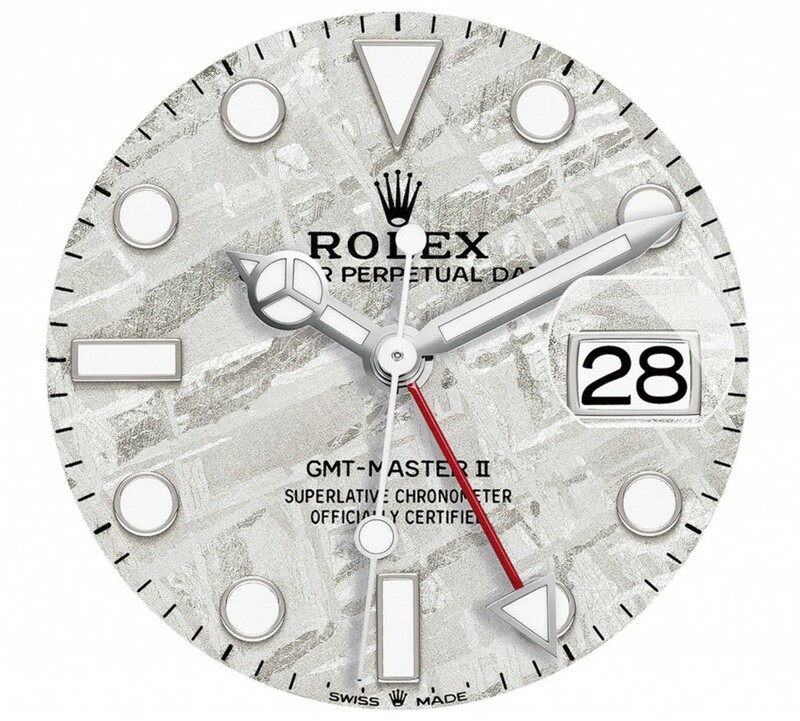 Time is exhibited on a meteorite dial with 18k white gold applied hour index markers in round, rectangular and a triangular shape at the 12 o’clock position. Circling the dial are also black printed minute index markers. A meteorite is a piece of a meteor that has fallen to the Earth’s surface from outer space, mostly made up of iron and nickel. 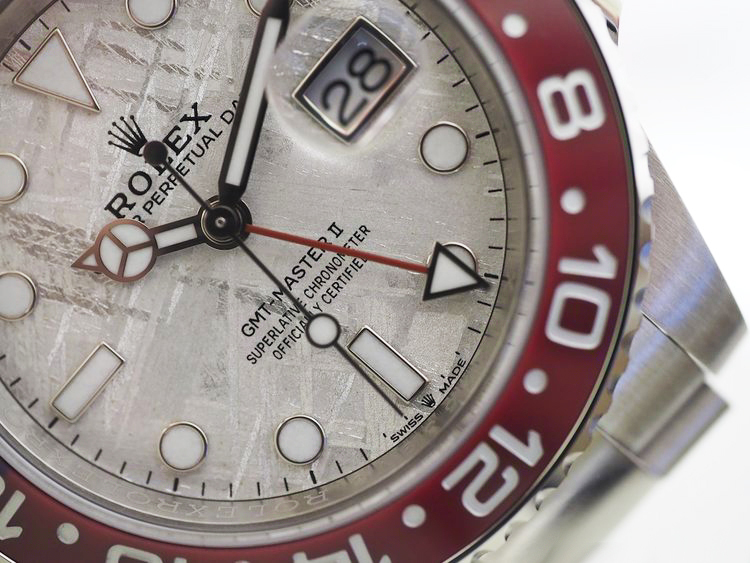 The central hands, hour index markers and arrow-tip of the red lacquered GMT hand, have all been fitted with a Chromalight luminescent material, for an enhanced legibility. There is also a date aperture at the 3 o’clock position with the aforementioned magnifying cyclops lens. This “Rolex GMT-Master II Meteorite” (Ref#: 126719BLRO) is powered by a self-winding in-house mechanical movement, caliber 3285 with 28,800 Vph. Power reserve on this watch can last up to 72 hours (3 days) when fully wound, thanks to a new barrel architecture and the superior efficiency of the caliber 3285 escapement. 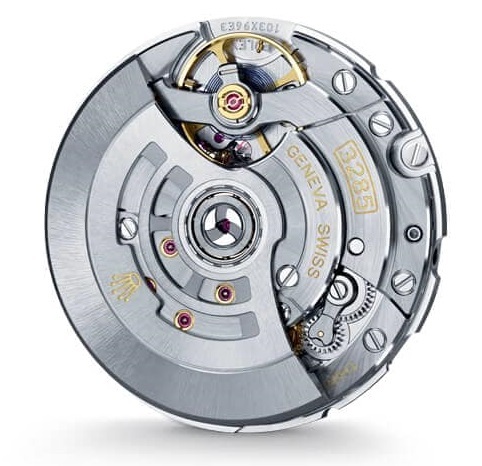 It also comes equipped with the updated Chronergy escapement that can provide up to 15% more efficiency.